^ Falkenheim, Victor C. Xinjiang. Encyclopaedia Britannica online. 27 March 2013. ^ Pletcher, Kenneth (编). The Geography of China: Sacred and Historic Places illustrated. The Rosen Publishing Group. 2011 [10 March 2014]. ISBN 1615301348. ^ 63.0 63.1 Rudelson, Justin Jon. Oasis Identities: Uyghur Nationalism Along China's Silk Road illustrated. Columbia University Press. 1997: 38. ISBN 0231107862. 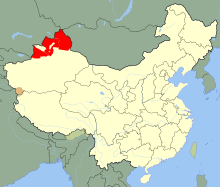 ^ Millward, James A. Eurasian Crossroads: A History of Xinjiang illustrated. Columbia University Press. 2007: 42. ISBN 0231139241. ^ 67.0 67.1 王柯. 《东突厥斯坦独立运动》. 香港·新界·沙田: 香港中文大学. 2013年: 第46页. ISBN 978-962-996-500-6. ^ 80.0 80.1 Bovingdon, Gardner. 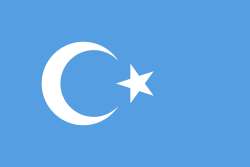 The Uyghurs: Strangers in Their Own Land. Columbia University Press. 2010: 25, 30-31. ISBN 978-0-2315-1941-0. ^ 正確認識新疆歷史，堅決反對民族分裂--黨史頻道--中國共產黨新聞網. dangshi.people.com.cn. 2010-11-17 [2019-01-08] （中文）. ^ Zenn, Jacob. Beijing, Kunming, Urumqi and Guangzhou: The Changing Landscape of Anti-Chinese Jihadists. China Brief (Jamestown Foundation). 23 May 2014, 14 (10). ^ Potter, Philip B. K. Terrorism in China: Growing Threats with Global Implications (PDF). Strategic Studies Quarterly. Winter 2013: 71–74. ^ Foreign Terrorist Organizations (PDF). US State Department: 237. 2005. ^ 新疆袭警案装置类似东突装备 疑犯身份查明. 星岛环球网. 2008年8月5日. ^ 新疆库车爆炸. 《财经》杂志. 2008年8月10日. （原始内容存档于2008-08-11）.